As many of you who follow me on Instagram know, I’m a cat lady. It all started with my childhood cat, a temperamental, sleek black cat named G. Just G. He was a rescue that upon regaining his strength showed his true colors as a creature that bites that hand that feeds yet desperately wants love & affection. As a teenager, I deeply related to that cat; we were kindred spirits. 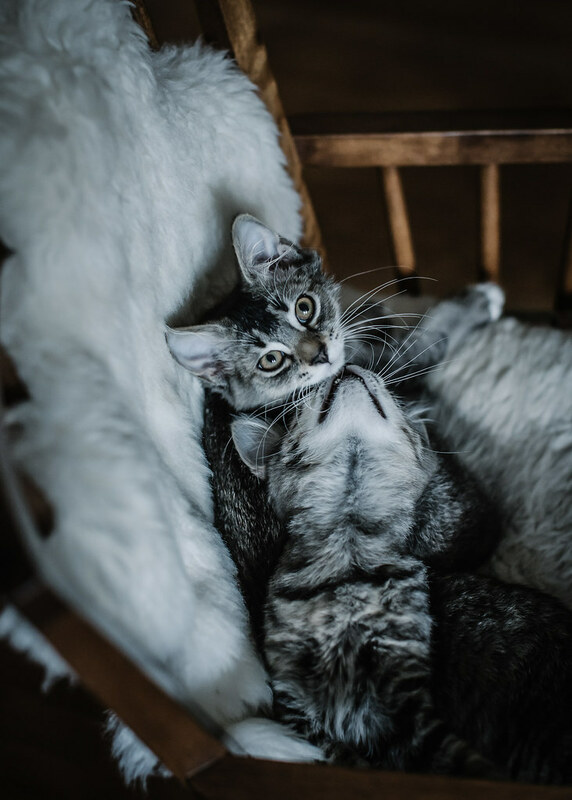 Over the years since G I’ve had Olive, Critter Lee, Gremlin, and now we have my two boys, the cuddliest of the bunch, that we adopted nearly a year ago as kittens: Kohi & Miruku (their names mean coffee and milk respectively in Japanese—we’re cheesy, I know). They make me happy when I’m sad, calm when I’m stressed, and laugh when I’m angry. So, yes, I had a birthday party for my cats. That’s what you’re looking at here. Well, that and photos of them from kitten to now. There’s nothing more personal than a party in honor of pets, and our friends love them as much as we do, so for their 1-year birthday (and to assure them that despite the baby coming they’re still our babies too) we had a fete last weekend. There was a farmer’s market inspired menu starring flatbreads topped with homemade ricotta, my favorite garlic scape & pistachio pesto, and all manner of local veggies like asparagus, radish, and nettles for the people folk (recipe below) & Fancy Feast Medleys, culinary combinations for kitties that elevate their meal & make them feel special, for the sweet beasts we affectionately refer to alternately as the “little princes” and “fur chickens”. They dined on Wild Salmon Primavera Pate with Garden Veggies & Greens—so I think that day they were the little princes. Usually they can be found counter surfing & destroying boxes of donuts under the cover of night (which leads me to believe they might be bored of kibble), but after this they were sated and let us eat in peace. Mostly. 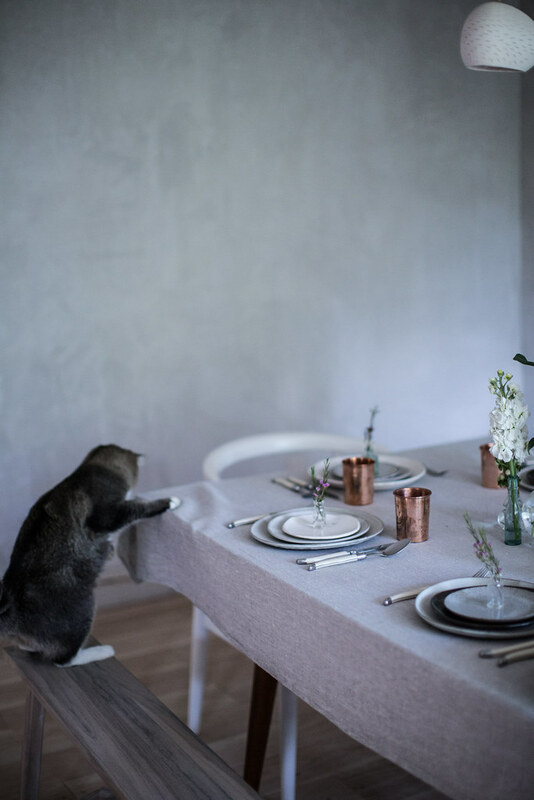 Intention & love are the ingredients that make anything great—be it dinner party, a recipe for flatbread, or a meal for feline friends. Keeping this around will lead to more happy moments for the baes…they’ll think it’s their birthday every week. Cause cats can’t calendar. There’s a lot of advice out there about how to curate a great guest list, but I think only one rule applies: invite people you truly want to see, connect with, and love. Don’t go with obligation, who knows who, or who’s the life of the party. Invite people you’re comfortable around, and you’ll always have a good time. Life is short, spend it with people who really matter to you. Brunch on a farm is a far different experience than dinner at home or a sunset cook out on the beach. Think about the occasion, the season, and what’s inspiring you. 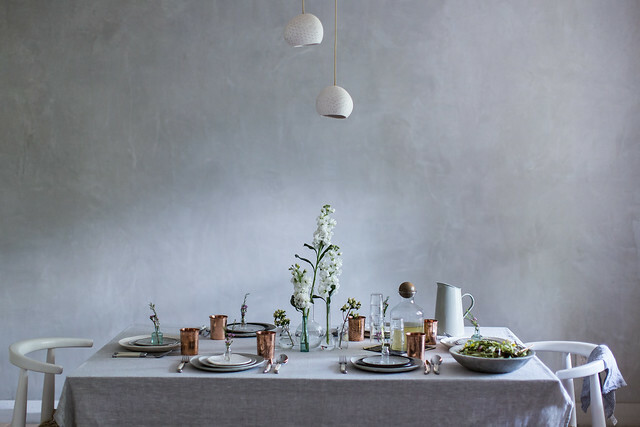 All dinner parties don’t have to be in dining rooms or be dinner at all! 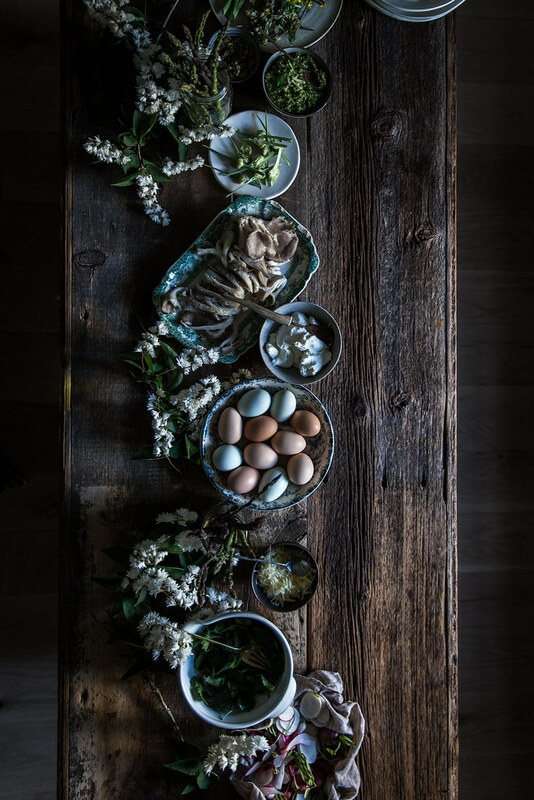 I’m a big believer in fresh flowers (usually foraged stems mixed with blooms from the local flower shop or farmer’s market) making an appearance on the table. My favorite part about foraging is that it’s free! 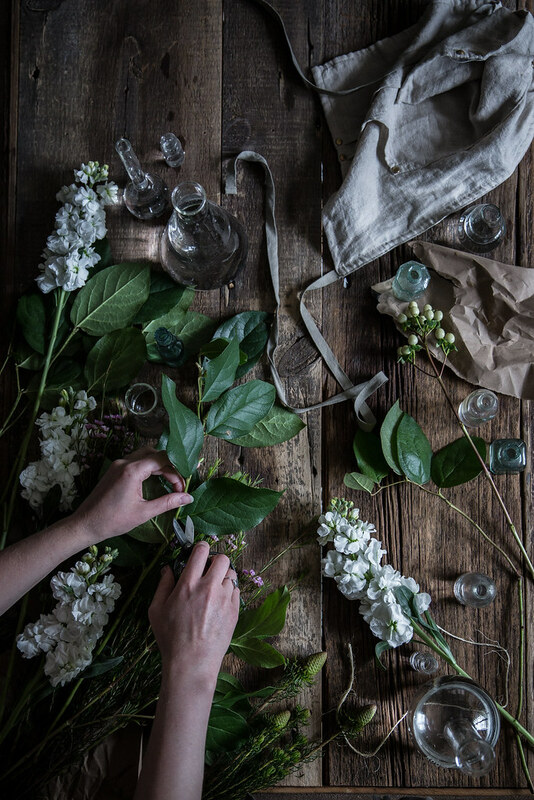 Wild rambling vines or branches plucked from your own street can be as beautiful as anything found in the shop. I like to do both. Here we used foraged flowers to decorate our “toppings bar” and used gems from the shop on the table. Think outside the box when it comes to arranging them. Sometimes I skip the vase altogether like on the bar and just lay the branches and flowers out, others I look for alternatives to traditional vases like the beakers I used on the table. I like music that sets a convivial mood but that doesn’t overpower the conversation. It should be an energizing flow that fills the gaps without dominating the soundscape of your evening. I really love French pop music like Francoise Hardy and Jane Birkin or a low key vibe like Beach House. I save my garage rock & top 40 loves (I’ve been known to swing from The Sonics to Flo Rida…) for the clean up. 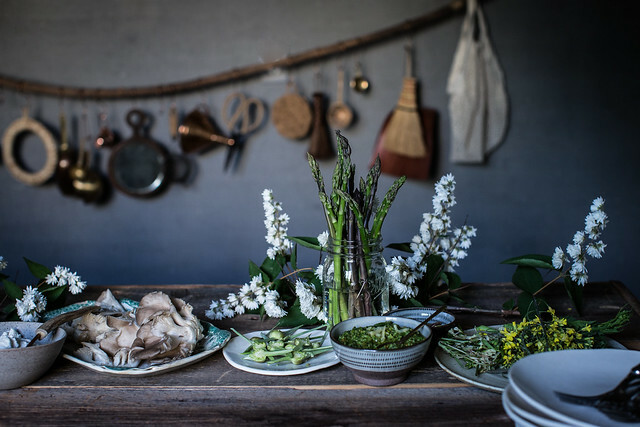 I believe a good menu always reflects the season, and I also think that if something particularly precious is in season (in this case asparagus & strawberries among others!) they ought make as many appearances in as many forms as possible on the menu. I want to highlight the best of the market more than I want every single thing to be different. 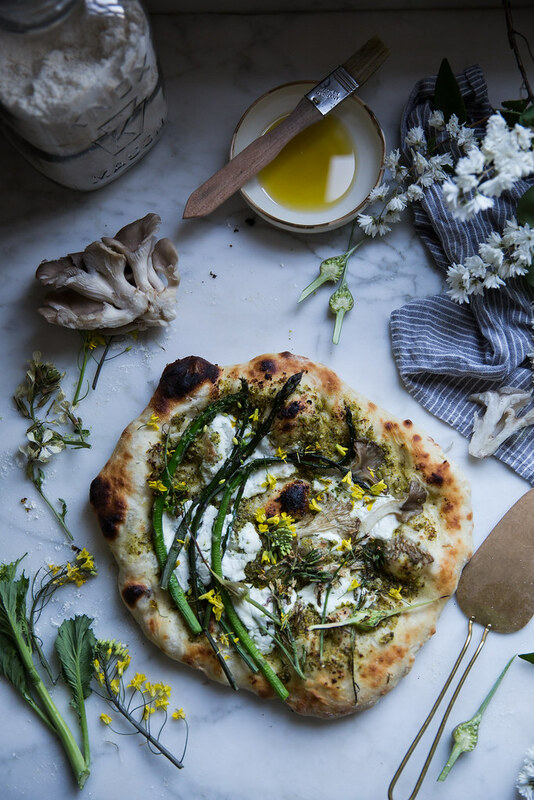 So I really let asparagus be the star of this menu with support from other spring favorites like garlic scapes, stinging nettles, and fresh herbs. For summer think local heirloom tomatoes, sweet corn, summer squash, peaches, and blackberries. To this day I have to google which side of the plate the fork is supposed to go on. 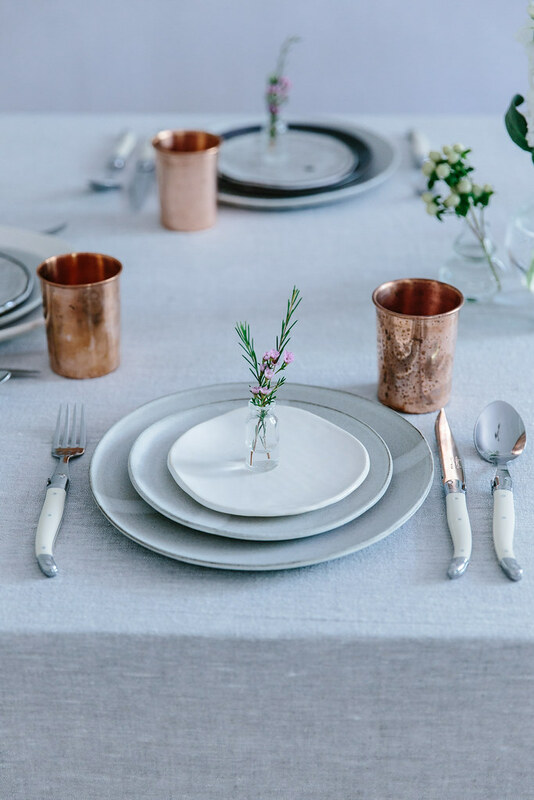 The beautiful thing about table setting now is there are no rules. Put out what you need, mix and match to your hearts content, and get creative. I always like to include a little touch of something special on each plate, flowers or herbs or greenery or a small gift. In this case, each plate had a little, vintage glass vase with a floral sprig in it. It sounds sentimental and cliché but what truly makes a meal special is the heart & soul put into it. 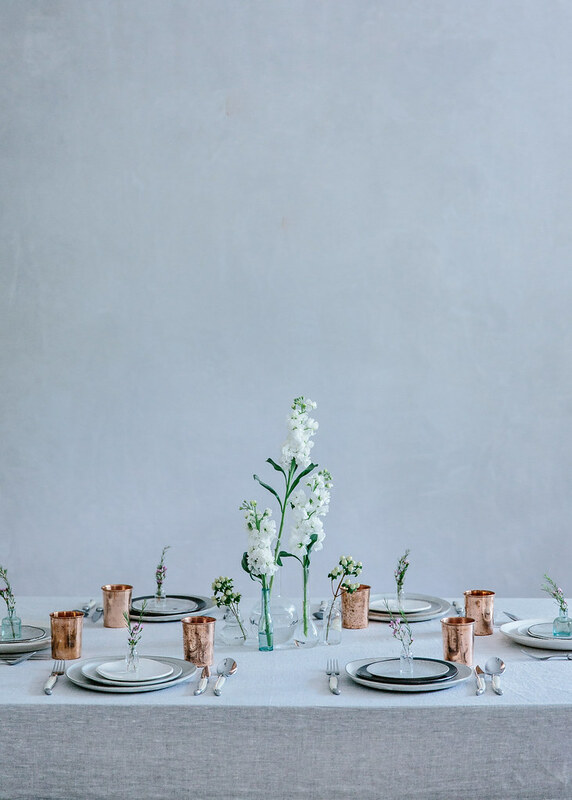 We all know that at the end of the day if you stripped away the music, the flowers, and the pretty table and just put a simple, homemade dish together in a matter of minutes and sat down with people you love, you’d have a great time. 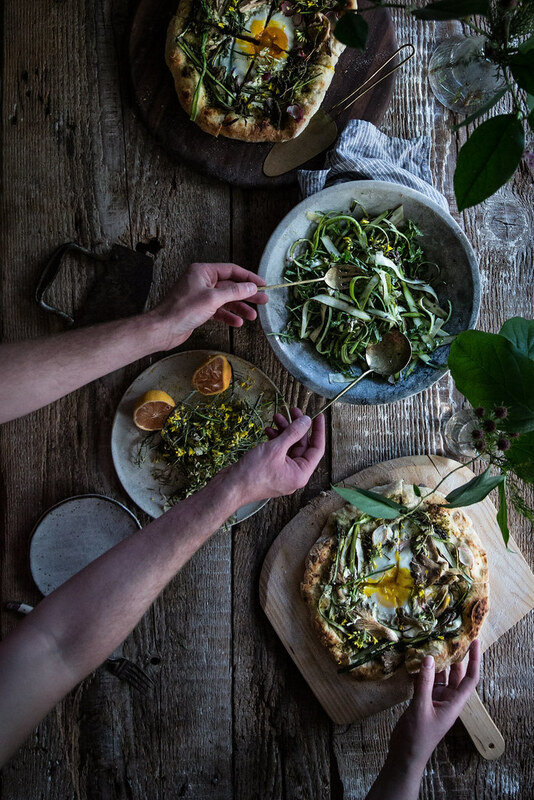 Food that nourishes and company that sustains, those are the only truly essential ingredients to a gathering. The rest is just nice. Relationships first, appearances second. Always. Lastly here’s our menu & the flatbread recipe. The evening before you intend to serve them, prepare your dough. It needs to ferment for about 18 hours after which you'll form it into balls for individual flatbreads. After forming, they can be covered & refrigerated up to 3 days, so you can easily make them ahead. 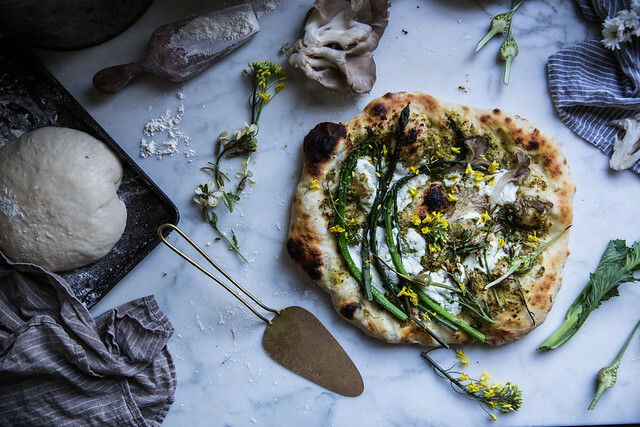 Before baking you'll need to heat your oven and your pizza stone for a solid hour as hot as your oven goes (500-550°F usually). If you're using the back of a baking sheet to bake them on (the alternative to a stone), you will not need to heat the baking sheet but will still need to heat the oven. When it's time to bake you'll switch the oven to broil. 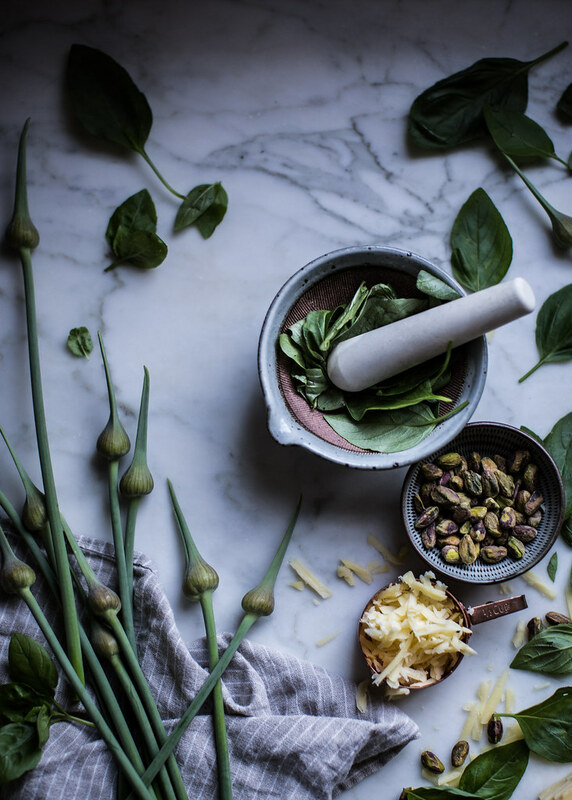 Prepare the pesto. 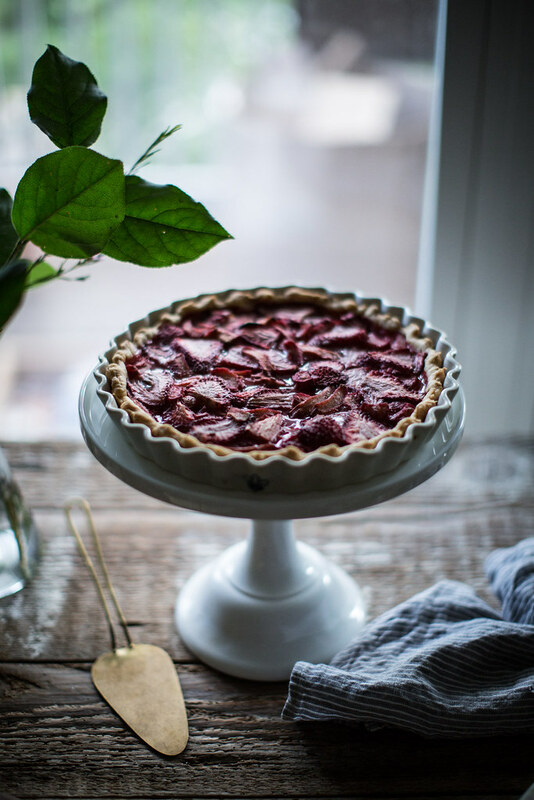 It can be made up to a week in advance or even months in advance if you freeze it, making this spring treat ideal to make in bulk and then save for use when you'd like a taste of spring later in the year. Place all ingredients except the olive oil in the bowl of a mini food processor and pulse until coarsely chopped and combined. Don't over process; pesto should have texture and not be smooth. Add the olive oil and pulse to combine. Taste and adjust seasoning, perhaps adding more salt or lemon juice, to your liking. Cover until ready to serve and refrigerate if not using that day. Form your dough according to the instructions in the recipe on top of your pizza peel which should be dusted with cornmeal or flour. I prefer cornmeal. You want to top them on the peel as once topped they will be difficult to transfer. To top, first brush lightly with olive oil. Then spread a couple of spoonfuls of pesto evenly over the flatbread. On top of that smash about 3 generous spoonfuls of ricotta on the pizza. I don't spread it evenly but rather just flatten a couple of dollops on top. 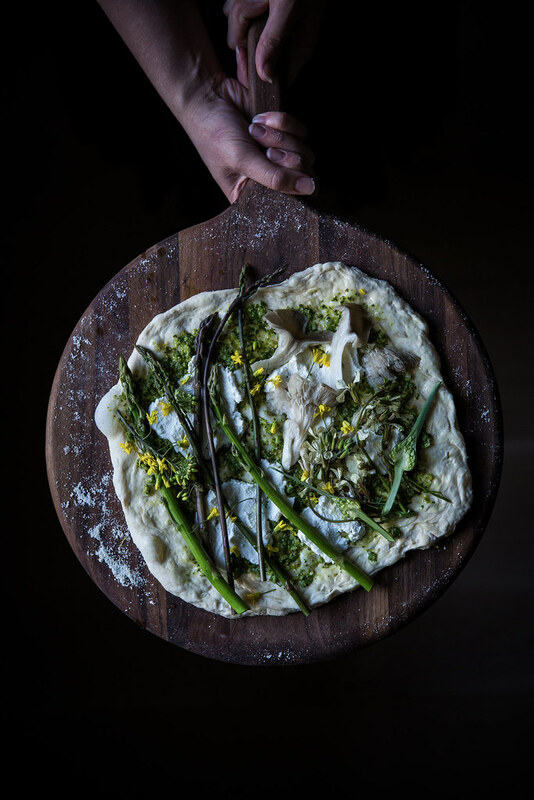 Arrange asparagus spears on top, lightly sprinkle, add any other toppings you like at this point except egg or flowers, and then lightly sprinkle with sea salt. Turn oven to broil when ready to cook, and bake flatbreads 5-7 minutes beneath the broiler (your stone should be heated on the highest rack in the oven as per the instructions). Mine usually take about 5. If topping with egg, I add it at the two minute mark. To transfer uncooked pizzas to the stone use a very quick, small back and forth motion to shimmy them onto the stone (which should remain in the oven). To remove, scoop them off with the peel. Top with herbs or flowers as desired, slice, and serve hot with small lemon wedges & a pinch of sea salt on the side. If I've added and egg, I salt the egg lightly once I remove it from the oven. Thanks to the makers of Fancy Feast for sponsoring this party for our babes! 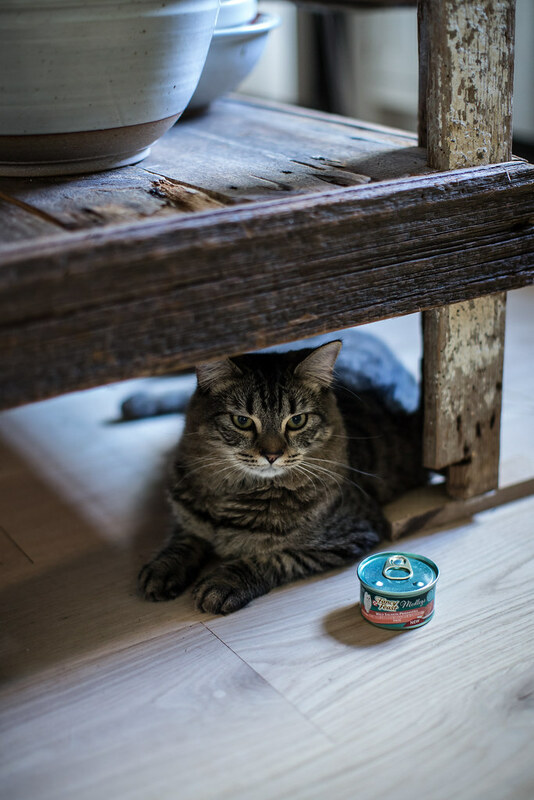 You can grab a free sample of Fancy Feast Medleys for your kitty friends here. 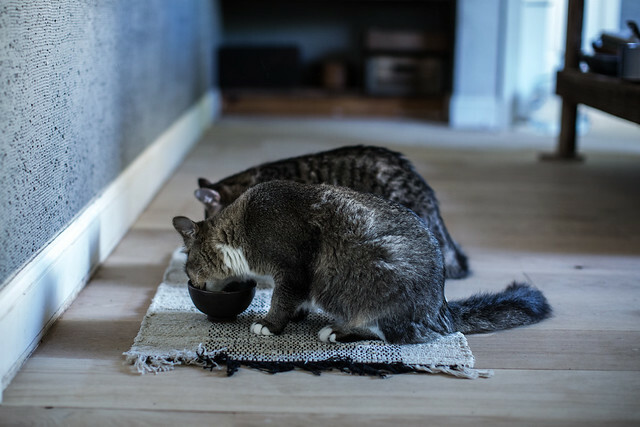 As per usual all opinions are my own (and the cats opinions are evidence by the photo of their faces buried in their bowls…) & thanks for supporting our sponsors that make it possible to keep running this site & creating content! These are great tips for an inspired party, and not bad tips for an inspired life. 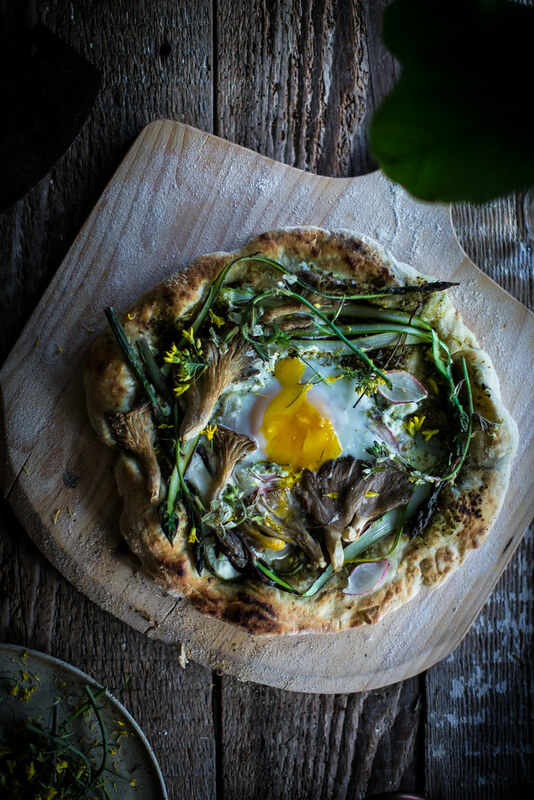 The flatbread is absolutely beautiful- I better go off and search for asparagus and garlic scapes. Your pictures! Beautiful, as always! 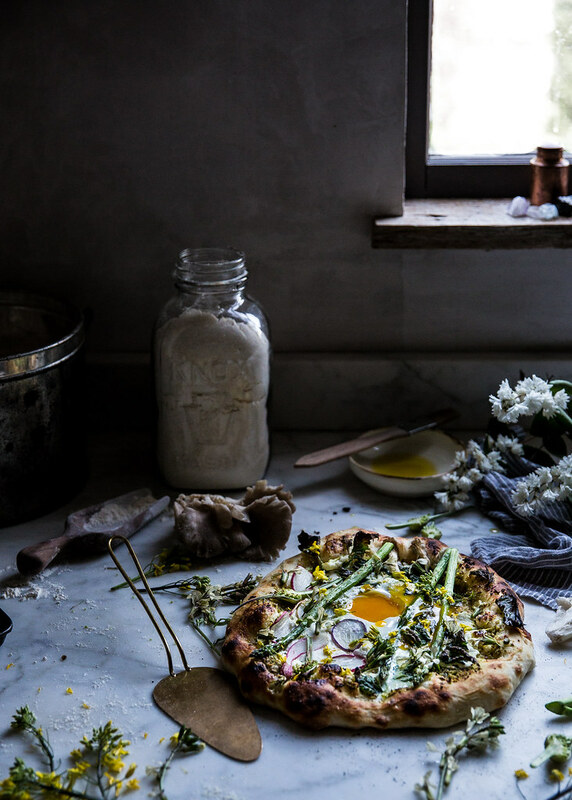 Plus what a lovely recipe for flatbread. Delicious! They are just adorable, and truly some very, very fortunate kittys! Lovely post, Beth. I am about to host a housewarming/birthday party for myself and invited people that I didn’t really want to see, but had to out of obligation. I wish I had seen this post earlier! I’ll still be sure to incorporate the others points you mentioned. 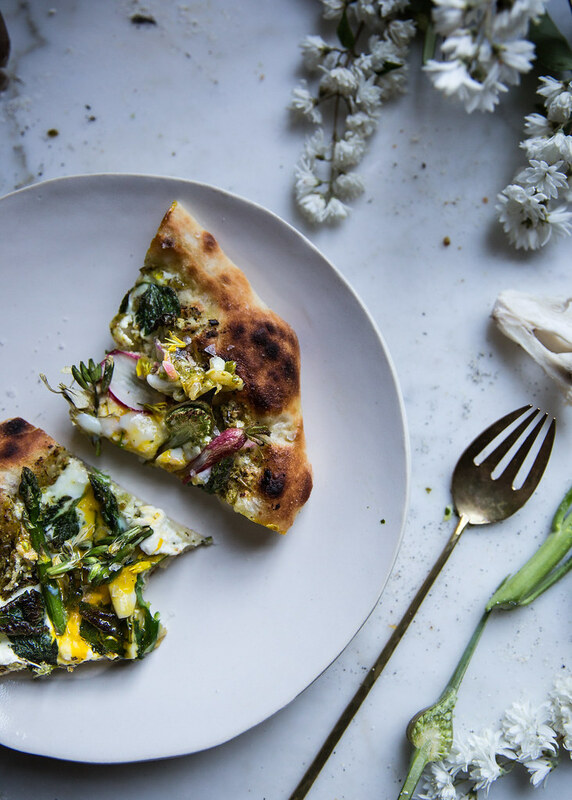 This flatbread recipe looks fantastic and super yum, but agree with Supal – the kitties win 😉 I just can’t focus on anything else when I see a cat. 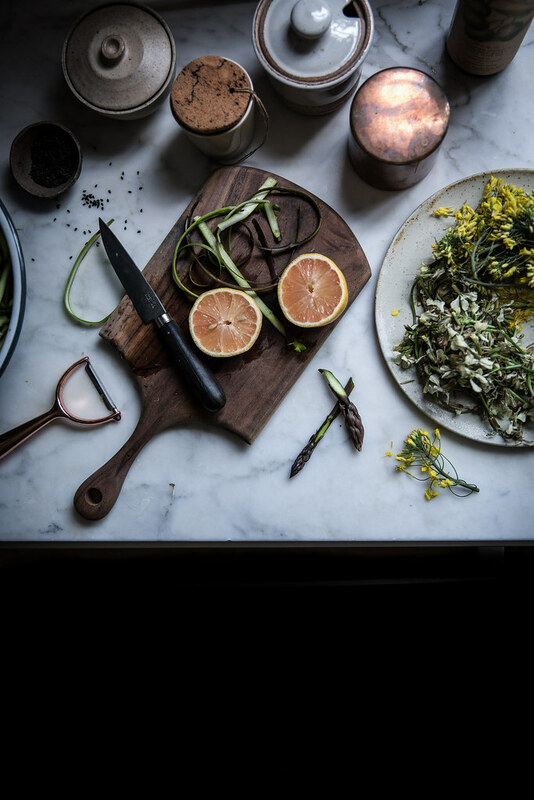 I always like serving what’s in season when I – very very very rarely – host a gathering at my place. Spring to me is perfect, because asparagus all the time, and I think I may be addicted to them!! 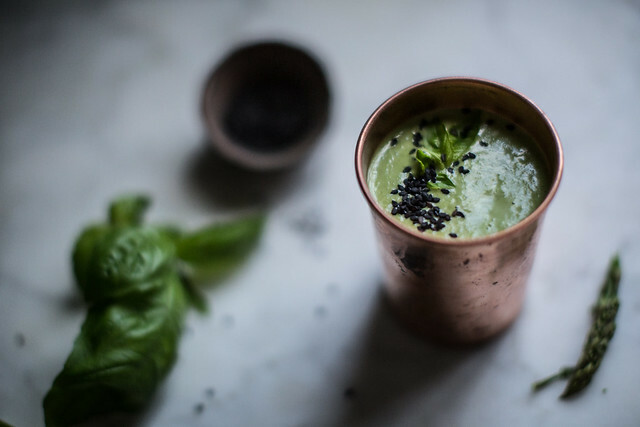 THese recipes are making me drool and be hungry, and even though I am not a cat person – people who know me wonder how can this be, as they always say I’m a bit of witch! – these pics of your babies are sweet! I am not a cat person, but you sure capture the charm of felines. 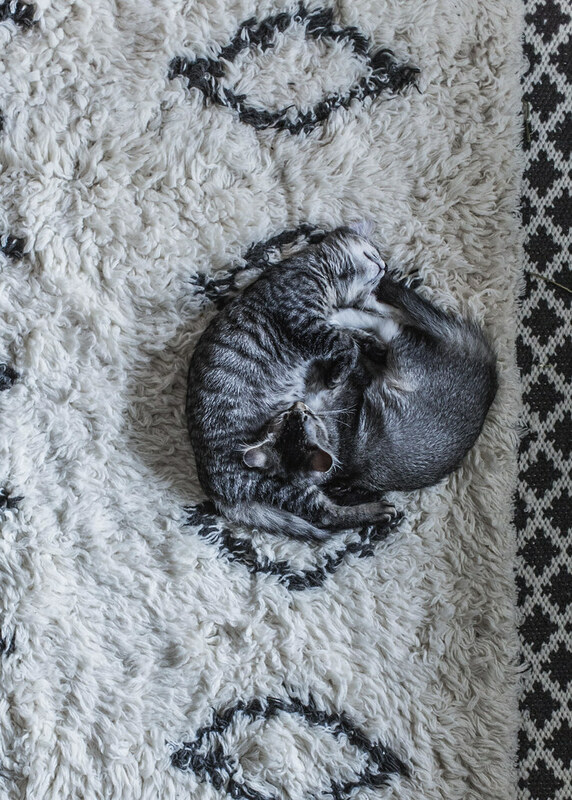 Where did you get that cute cat rug??? Your point of people first, appearances second, so important. I love your posts, they are balm for the heart, always. What a lovely post (& blog). I especially love “Cause cats can’t calendar.” Made me laugh 🙂 I shall certainly be trying out some of your recipes,thank you for sharing. For Christmas one year I gave my kitties some salmon (from a can) and beef broth (no additives). It went over splendidly, so splendidly that I didn’t hear the end of it from my cats (especially one of them) for a month; hopefully your cats will be less fanatic. Unrelated, where is your mortar & pestle from? It’s gorgeous. Love your style, photography excellence, and such a kinfolk mood here. The flat bread pizza is similar to one I make yet with a balsamic sun dried tomato base. I will return to your beauty. 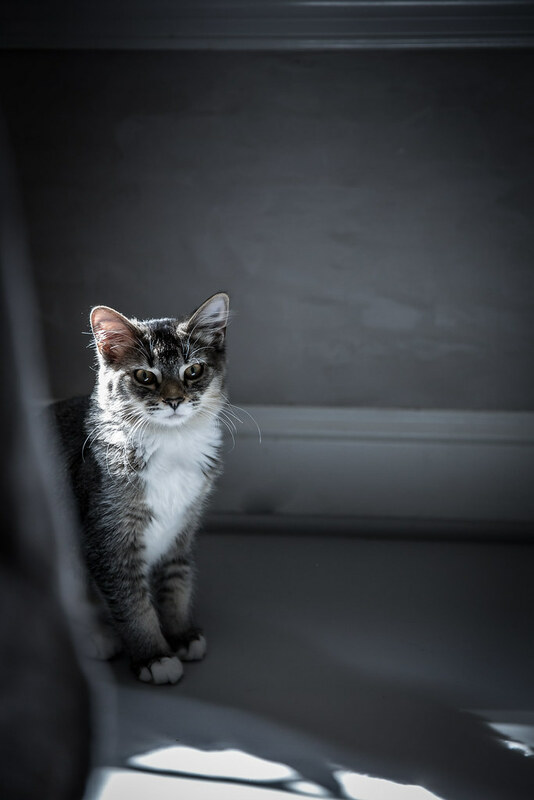 This whole post is purrfect from beginning to end! The photos are beautiful, as always. 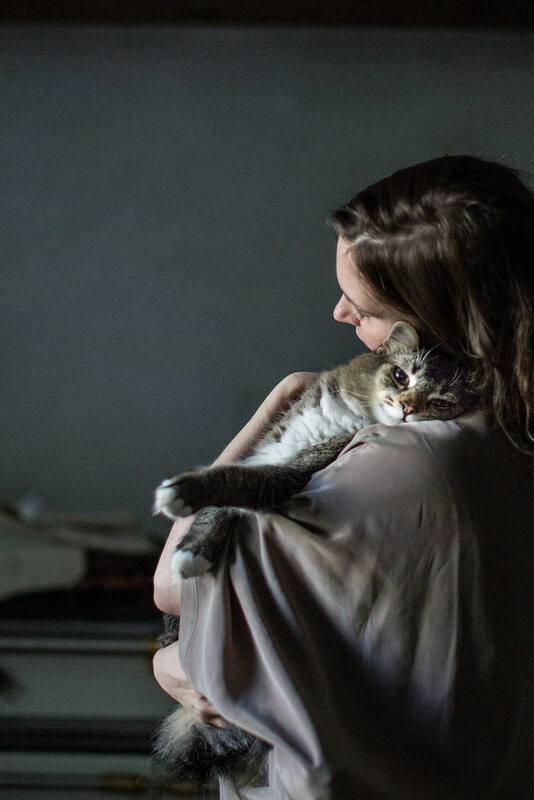 I especially love the one cuddled on your shoulder- unconditional love. My Persians are my babies- Coco Puff and Elvis Asher Pawsley ( named by my adult babies). 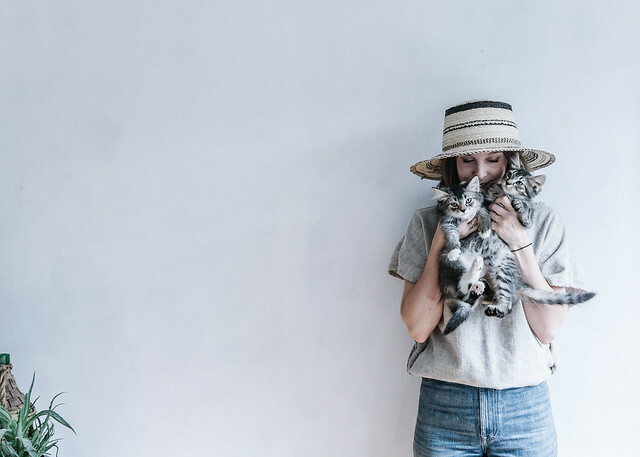 I love your kitties names- more my style! The food looks absolutely delicious too, can’t wait to try this recipe. Thank-you for this delightful blog. 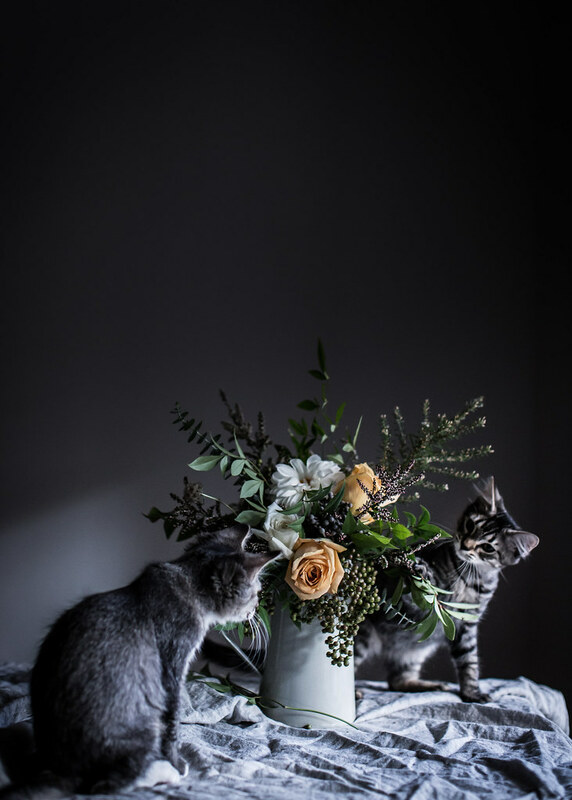 The photo of both cats looking round the vase of flowers at each other and the one with them lying down in a ying-yang shape were my favorites! I love how you also made them something special to eat. I know us pet-lovers would think it a no-brainer for their birthdays but so many don’t and think we’re crazy. I think we’re just giving back as much as we can for the love and memories they’ve given us. And thanks for inspiring me to have a summer feast just because! I love – and cook and cats. Your post cheered me up. Very beautiful photos! 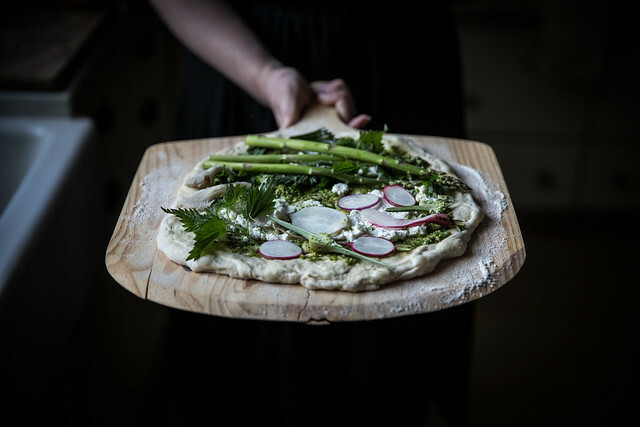 No doubt, this flatbread with asparagus, garlic and cheese ricotta very tasty! Your cats and photos in retro style are wonderful !